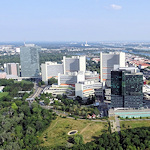 The best views over Vienna? You spend much of a trip to Vienna looking up and around. But there’s a lot to be said for looking down. With a diameter of over 60m, the view across the city rooftops and over the Prater park is rather good. But it’s the whole experience, rather than the view, that makes the Riesenrad giant Ferris wheel worth a visit. This is a “thing” built on top of a hill in front of the Habsburg summer palace at Schönbrunn. I’m sure there’s a technical word for it, but it’s basically an intricate facade they constructed to give Emperors and Empresses something nice to look at from their bedroom window. Anyway, from the Gloriette you can look down over quite a bit of Vienna. It’s not the very best view of the city, but it’s a pretty good one (especially in summer with the Schönbrunn gardens and palace below). Like the Riesenrad, it’s the experience that counts as much as the view – you’re standing on a bit of 18th century Imperial history. The new Sofitel in Vienna is already becoming a bit of an iconic spot, despite only opening this century. Located on the banks of the Danube canal, the hotel’s “Das LOFT” restaurant and bar has a clear view across the old town rooftops. If you don’t mind travelling to the edge of the city, you can go up the Kahlenberg “mountain”, which is just under 500m above sea level and looks over the city and the Danube valley. There’s an observation tower at the top, as well as (surprise!) a restaurant and coffee house. You can reach Kahlenberg by car, but also by bus: line 38A to the “Kahlenberg” stop. This is an old flak tower close to the centre that houses a rather nice aquarium and vivarium. And at the top it has a roof terrace with glass walls, offering a 360° panorama of the entire city.